Is the ‘Amazon effect’ on rising rents in North Seattle real? Rents in Seattle north of the Ship Canal have breached a costly threshold for a couple of reasons, including the Amazon boom. The days when you could save a few bucks by renting north of the Ship Canal are rapidly drawing to a close, according to a new report from Seattle-based Zillow. Is it another example of the “Amazon effect” that’s driving up rents in some city neighborhoods? 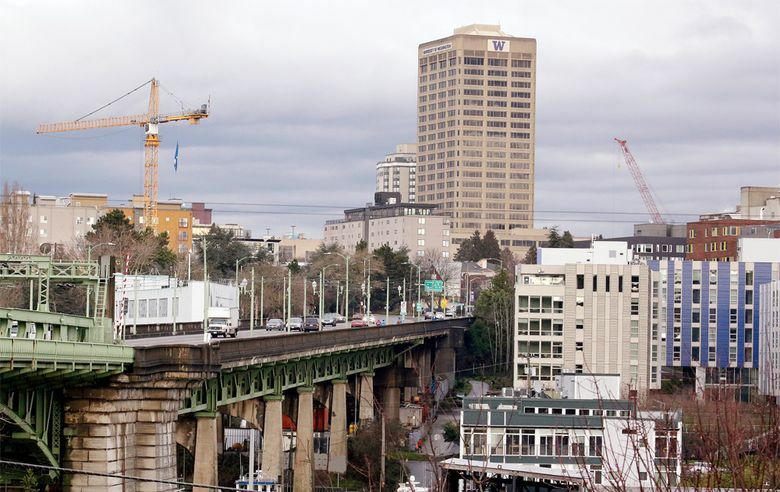 In the stretch from Ballard to the University District, rents shot up sharply between 2014 and 2015, according to data from Zillow, a national real-estate company. Nearly every census tract in this area saw its median price per square foot spike by double digits in that one-year period, increases ranging from 11 to 24 percent. To be sure, there were similar increases in the far north and south ends of the city, such as Lake City and Rainier Valley. These, however, are some of the least expensive sections of Seattle. So as folks get priced out of the more central neighborhoods, demand here is growing. Even with the jump in rents, these areas are still significantly cheaper. But the neighborhoods along the north side of the canal weren’t exactly a bargain to begin with — so what’s driving up the rents here so quickly? Aaron Terrazas, a senior economist at Zillow, says it may be due to the popularity of this area among Amazon workers. 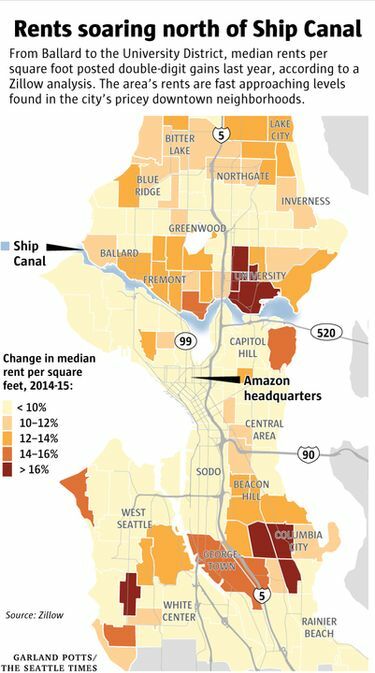 Terrazas analyzed employment data from the U.S. Census Bureau to analyze the blocks with Amazon’s South Lake Union offices and see where people working there actually reside. “You see a lot of South Lake Union workers live in that strip just north of the canal,” Terrazas told me. Even so, Terrazas cautions against blaming rising rents here solely on an influx of Amazon workers. Another driver of rents north of the Ship Canal is the increase in density from new apartment buildings. And in fact, according to the data, the neighborhood that experienced the steepest rise in rents in the city has a relatively low concentration of Amazon workers: the University District. So what’s behind the astounding jump in median rent per square foot — 24 percent in a single year? Again, it’s most likely due to the slew of new apartment complexes recently opened in the neighborhood west of The Ave. The arrival of the light rail at Husky Stadium also makes the area more desirable for downtown Seattle workers. Terrazas said he’s also heard reports of more University of Washington students seeking off-campus housing as dorm fees increase. Wallingford, Ballard and — likely to the dismay of UW denizens — the University District.